Opera-lovers coming to St Martin's Lane may feel confused to be confronted by an unrecognisable Coliseum, which now has huge girder-like structures adorning the stage and ceiling and a rather ugly skyscraper looming out of the wings, called Falco Tower. Happily, the producers had left a copy of the bogus newspaper, The Obsidian Times, on every seat, which offered some handy background about the plot of Bat Out of Hell - the Musical. Obsidian (a bleak anti-Manhattan) is falling into slum-infested wrack and ruin under the despotic leadership of Falco, the Commander-in-Chief. However, his wife Sloane is a much nicer person and is trying to rejuvenate the city, while his heiress-daughter Raven is just turning 18. Meanwhile, a bunch of kids called The Lost are frozen forever as teenagers after being exposed to weird toxic gases, and Falco is obsessed with hunting them down in the caves and sewers where they're hiding. Bat… is of course the brainchild of Jim Steinman, and the original album from 1977 (with Meat Loaf at the microphone) has sold a healthy 43 million copies. For this stage incarnation, Steinman has collected material from the original Bat and its two sequels, written a couple of new pieces, and shrewdly found a slot for the propulsive “Dead Ringer for Love”, Loaf's 1981 hit on which he duetted with Cher. 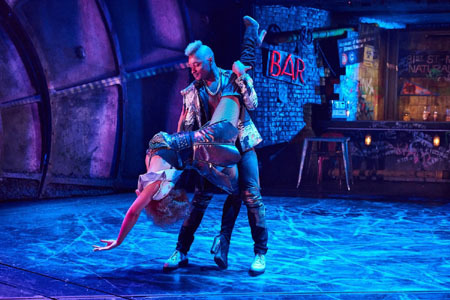 Filling Meat Loaf's enormous shoes is a task no sane individual would attempt, but director Jay Scheib and his crew have assembled a dynamic young cast who put bags of zip and fizz into their dance routines and sing their hearts out in the many chorus sections. Among the leads, Rob Fowler brings a villainous darkness to his portrayal of Falco (a man not afraid to electrocute and waterboard his opponents), Sharon Sexton lends a simpatico softness to Sloane, and as Raven, Christina Bennington projects yearning, frustration, and disgust with her controlling and fascistic father. Tasked with putting the stratospheric icing on Steinman's bombastic musical cake is all-American Andrew Polec, who plays Strat, leader of The Lost. Slender and blond-haired, he barely looks capable of shouldering his heavy load, but as the show bounces from peak to peak, he proves himself equal to every challenge, hitting the big sustained top notes as if daring them to be longer and higher, and even essaying a spot of Roger Daltrey-style microphone-twirling. His show-opening soliloquy about blazing Fender guitars is a bit peculiar, but he starts to cut loose in “It Just Won't Quit”, a yearning duet with Raven (hint: they're predestined for each other), and when he leads the huge ensemble eruption of “Bat Out of Hell” that closes the first half, the show's mixture of fantasy, sci-fi and crazed ambition clicks into sharp focus. It's in the non-musical sequences that Bat can fall flat. Both Bennington and Polec have an unfortunate habit of delivering their dialogue in a kind of sobbing quaver, designed to suggest the anguish of impossible dreams and young love denied, but in practice becoming quite irritating (Polec occasionally sounds a bit like Gene Wilder at his most neurotic). The saving grace is that you're never more than about four minutes away from another giga-ballad or monstrous rocker, and the music is huge and confident enough to carry the story. It reminds you of how theatrical Steinman's original concept really was, since his songs are crammed with tempo changes, climaxes, quiet bits and hooks, like a sequence of mini-operas. In “All Revved Up and No Place to Go”, the ensemble turn teen dreams into hot flesh, while “Paradise by the Dashboard Light” becomes a nostalgic reverie of primitive rock'n'roll as Falco and Sloane recall that even they used to be young, wild and stuffed with rampant hormones (there's a crafty stunt where their car crashes into the orchestra pit). “I'd Do Anything for Love” attains a stature here it couldn't manage in the Beauty and the Beast video which accompanied its release in 1993. 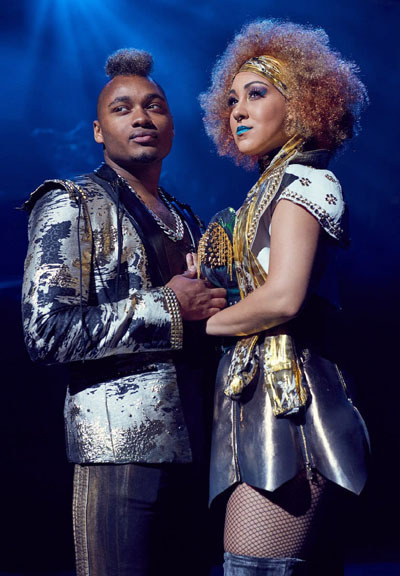 A special mention for Danielle Steers as Zahara and Dom Hartley-Harris as Jagwire, two awesome singers who share some of the show's brightest moments, especially their heart-rending performance of “Two Out of Three Ain't Bad”. The cast's strength in depth was further revealed in “Objects in the Rear View Mirror”, where a trio of Lost boys replayed their painful pasts. You might say they built this city on rock'n'roll.